Last weekend, El Salvador elected Nayib Armando Bukele Ortez, 37, to the presidency. The businessman and former mayor’s path to the presidency was circuitous, marked with struggles to find a political party — which may ultimately have proven a good omen, as polls suggest that Bukele’s supporters were dissatisfied with the country’s traditional political parties. Bukele has called himself a man of the left and began his political life in the leftist Farabundo Marti National Liberation Front (FMLN). However, he ended up running for president with the conservative Great Alliance for National Unity (GANA) party. “It’s hard to see where he fits into current Latin American politics,” said Mike Scranton, professor of political science at the University of Scranton and former Fulbright scholar to El Salvador. 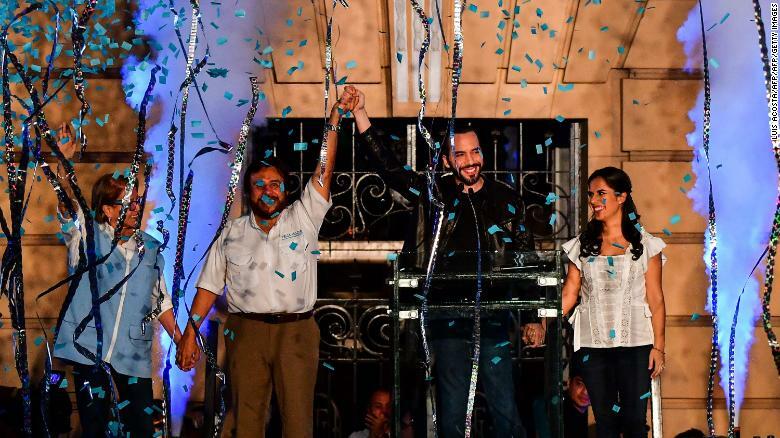 Bukele, his wife Gabriela Rodriguez, and vice president Felix Ulloa celebrate after winning the presidential elections. Bukele, who often appears in a glossy leather motorcycle jacket and slicked-back hair, is a Yamaha motorcycle distributor and a declared supporter of Salvadoran soccer team Alianza. His wife, psychologist and ballerina Gabriela Rodríguez, accompanies him on most political activities. In January, Bukele announced that that the pair would soon be parents, tweeting a photo of an ultrasound. He has stood out from traditional presidential candidates for his reticence with the media. “Bukele favors technology and speaking directly to the people rather than through traditional media,” added Scranton. He has also been a fierce critic of past presidents, with campaign slogans such as “There’s enough money when nobody steals” and “Return what was stolen,” referring to the alleged disappearance of funds during the administrations of former Presidents Francisco Flores and Antonio Saca. Flores died in January 2016, when he was waiting for a trial date for diversion of funds donated by Taiwan. In September 2018, Saca was sentenced to 10 years in prison for embezzlement and money and asset laundering. Bukele began his political career in 2012 as the FMLN-backed mayor of the small town of Nuevo Cuscatlán. In 2015, he won the mayoral elections of San Salvador, defeating a conservative candidate whose party, the Nationalist Republican Alliance (ARENA), had ruled for two terms. After Bukele became mayor, the political relationship between him and his party began to deteriorate. Some analysts say the FMLN considered Bukele too harsh a critic of the then-government of Salvador Sánchez Cerén. In September 2017, municipal comptroller Xóchitl Marchelli accused Bukele of “throwing an apple” and calling her a “witch” during a meeting of the San Salvador City Council, which Bukele denied. The next month, the FMLN expelled Bukele, citing Marchelli’s allegations and accusing Bukele of promoting divisions within the party. 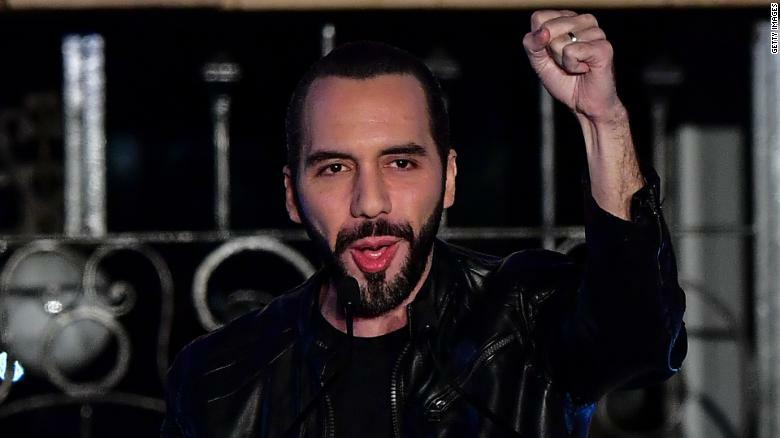 Bukele took to Facebook Live to announce that he would start a new political party called “New Ideas,” but it turned out to be a short-lived venture. Struggling to accredit the nascent party with the Supreme Electoral Tribunal while presidential elections loomed, Bukele abandoned New Ideas and joined an existing party called Democratic Change. Then in July 2018, Democratic Change was shut down along with three other parties for failing to acquire a minimum number of votes in the 2015 election. Bukele was forced to find a yet another political party to back his candidacy. Just six months before the elections, Bukele finally found GANA, a party that could last all the way to the presidency. And indeed it did. Previous articleFacebook wades into world’s longest civil war, but does it know what it’s doing?